For Throwback Thursday this week we’ll take a look at Chris Borland’s career and legacy as a Wisconsin Badger. Chris Borland was one of the most successful linebackers to ever put on the Cardinal and White. He saw a long career, complete with huge stats and plenty of awards and recognition. He enjoyed a lot of team success as he played from 2009-2013. Not many Wisconsin defenders are able to say they made the same impact Borland did and he remains to this day, even with some of the great defenders that have played for Wisconsin in recent years, one of the best ever. 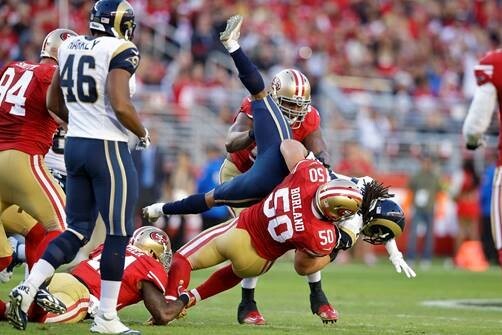 Chris Borland was a tackling machine. He recorded three consecutive seasons with over 100 total tackles and was always in the mix at the end of the play. After every whistle, the number 44 jersey was at the bottom of the pile without fail. Borland was more than just a sound tackler though. He did a bit of everything on defense, which is what made him so great. He could rush the passer, he forced fumbles, and he even played well in coverage. Borland was a true every-down linebacker. Wisconsin’s defenses benefitted greatly from his play. From 2011-2013, the three 100+ tackle seasons from Borland, Wisconsin’s total defense went from 34th to 29th to 9th in the country. The 2013 season saw Borland being named an FWAA first-team All-American and win the Big Ten Defensive Player of the year. Chris Borland came along right at the height of what we thought Wisconsin Badgers football could be. He played through the three Rose Bowl years and even stayed for Gary Andersen’s first year in 2013. In times of great vulnerability, he did everything he could to keep Wisconsin steady and establish a culture of playing great defense in Madison. In the fours years since Borland’s eligibility has expired, Wisconsin’s total defense has ranked 9th, 2nd, 13th, and 4th nationally. And several Wisconsin linebackers have gone on to follow in his footsteps to the NFL. Borland’s NFL career was a roller coaster. He was originally a bit undersized to play linebacker at the NFL level but earned his chance about midway through his rookie season. In eight games he racked up 84 tackles and looked like a steal. Borland suddenly retired after his rookie season due to the risk of head injuries. He said he wasn’t feeling symptoms of any major head injuries, but he wanted to be proactive about the risks. Borland was the contradiction that has become American football. We love to see guys play as hard and physical as he did, but it comes with great risks that eventually shortens careers one way or another. It would be great to see Borland still in the league representing the Badgers, but he made the ultimate choice of protecting his own future. And he deserves nothing but respect for walking away from the game when he did. The time he spent on the field was incredible and the legacy he left, and the culture he helped create, will live for a long time.